The heart of the Wassererhof estate is its historic “maso,” or farmhouse, that dates back to 1366, when the Princely family of Liechtenstein commissioned its construction next to a wellspring that augured both fertility and wealth. Over the hundreds of years between its construction and today, the maso has changed hands many times. In fact, during the fascist period, the Italian government purchased it in a failed attempt to settle ethnic Italians in Süd Tirol! By 1991, the property ended up in terrible disrepair. In 1996, the father of Andreas and Christoph Mock had the opportunity to purchase the ruins, and the family immediately set out to restore it to grandeur. The Mock family were always contadini (farmers) in Valle Isarco, growing mostly apples and later grapes to sell to the co-op. Christoph studied agronomy, and ended up as a consultant to his father and local farmers. Andreas, meanwhile, studied commercial accounting and went to work for the local commune. But by 2004, they had both had enough of working for other people, and opened the Wassererhof agriturismo in the restored maso. They were growing primarily apples, but also planted Sauvignon Blanc and Pinot Blanc – at the time, they were the first to plant white grapes in the lower Isarco valley! 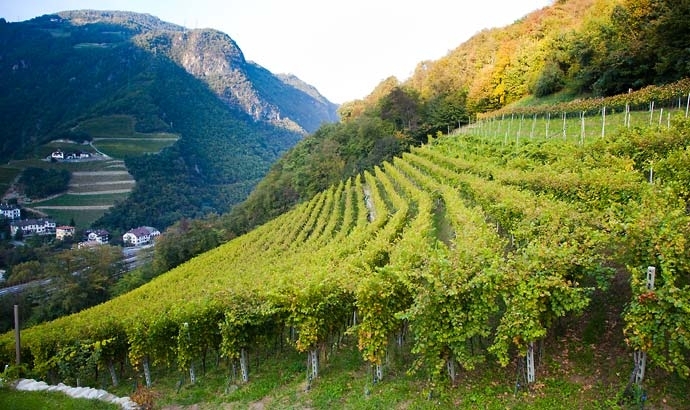 White varieties were normally cultivated to the north near Bressanone because the steep hillsides and western exposure of Fie allo Sciliar only allowed sunlight from 10AM. But with climate change, this area has become quite viable. Christoph follows all of the work in the vineyard and cantina, while Andreas is the chef in their buschenschank (wine bar/tavern), and also helps in the cantina. In the first years, the brothers sold grapes and kept a part for the “vino sfuso” that they would sell by the pitcher at the tavern. But by 2013, demand had grown enough for their wines that they decided to start bottling wine. Fast forward to 2016, and while skiing in Alto Adige, we came across a “Hof” wine that we had never heard of and decided to give it a shot. This lead to tour de force tasting at VinItaly in the spring, and we were immediately overcome by that exciting feeling that we had found something new and special to introduce to you! Currently the estate makes three wines, Sauvignon and Pinot Blanc from 3.5 hectares surrounding the maso, as well as a St Magdalener from 3 hectares closer to Bolzano. Total production is currently 3000 cases, most of which is consumed locally in Valle Isarco—Skurnik Wines is the first and only importer in the United States!